the number of sports related eye injuries can be dramatically reduced. detect the electrical impulses and they travel to the brain. 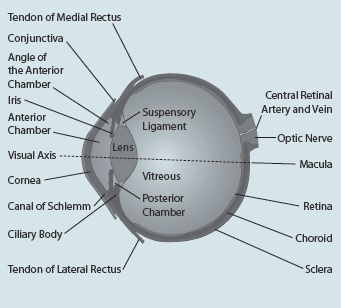 Anatomy of the eye includes lacrimal gland, cornea, conjunctiva, uvea (iris, choroid and ciliary body), lens, blood supply, retina, vitreous and optic-nerve. While the incidence of sports related eye injuries is low, their severity is usually quite high as injuries to the eye can result in permanent eye damage and loss of eyesight. Research has shown that 30% of sports related eye injuries in children have the potential for permanent loss of eyesight. Research indicates that beginners are more prone to eye injuries than intermediate or advanced players as beginners are yet to learn or refine the skills necessary to master the specific sport and play safely. Sports can be classified on the basis of high risk, moderate risk and low risk for eye injury. Note: the sports listed below are in alphabetical order and in no way indicate a greater or lesser incidence or risk of eye injury. Involve a high speed ball or puck, the use of a bat or stick, close aggressive physical body contact with intentional or unintentional collisions or a combination of these factors. Australian Rules football/rugby union/rugby league. Do not involve a thrown or hit ball, a bat or stick, or close aggressive play with physical body contact. Most eye injuries in sport are preventable. Minimising the severity and incidence of eye injuries in sporting environments is based on the following three principles. 1. Modifying rules in junior sport to limit the risk and ensure safe play. 2. Developing coaching procedures and practices that encourage safe play. 3. Where appropriate, wearing protective eyewear, which meets Australian Standards AS/NZS 4066 or AS/NZS 4499. The following should also be considered to decrease the risk of eye injury in sport. Players who have poor vision in one or both eyes should wear appropriate eye protection. Consultation from an ophthalmologist or optometrist is essential. Contact lenses offer no protection. Therefore, players who wear contact lenses must also wear appropriate eye protection. The importance of good sportsmanship and fair play should be emphasised. Coaches should develop clear rules for training and general conduct and always discourage violence or dangerous techniques. Appropriate protective eyewear is a proven measure to prevent eye injuries in sports. Wearing appropriate protective eyewear is strongly recommended. Ordinary prescription glasses do not provide adequate protection. 1. Using only eye protectors that are currently recognised under Australian Standard (i.e. AS/NZS 4066 – sports eyeguards or AS/NZS 4499 – sports helmet). 2. Having an ophthalmologist or optometrist assist the athlete/player in selecting and fitting the appropriate protective eyewear. Caused by fingernails and fingers and usually result in redness and pain, which should clear within a few days without serious long-term effects. Caused by blows from fast moving projectiles (i.e. balls, racquets, sticks or fists/fingers). They can cause bleeding externally (i.e. black eye) or within the eye itself. Blunt traumas can also cause broken bones around the eye. In these types of injuries, a foreign body penetrates into the eyeball. This is most likely to occur when sports participants are wearing ordinary spectacle lenses as these can shatter on impact, possibly driving fragments into the eye. Do not examine or touch the eye. Do not forcibly remove any foreign object from the eye. Gentle flushing with general saline to remove dirt/grit is reasonable. Do not administer any creams/drops before medical assessment. Pad the eye and gently tape or firmly bandage a sterile dressing to the injured eye. (N.B. if the player will allow, it is preferable to cover both eyes). Pressure to the injured site should be kept to a minimum. Consult a medical practitioner or eye specialist or attend the emergency department at your nearest major hospital. Athletes with a serious eye injury should be examined by an ophthalmologist and return to play only if the doctor says it is safe. The injured eye should feel comfortable and have adequate vision. The athlete should wear eye protection. For a less serious injury, the team sports medicine professional can usually decide if the athlete can return to play based on the type of injury and how the athlete feels. Athletes should never use topical anaesthetics (pain medicines) so they can keep playing.